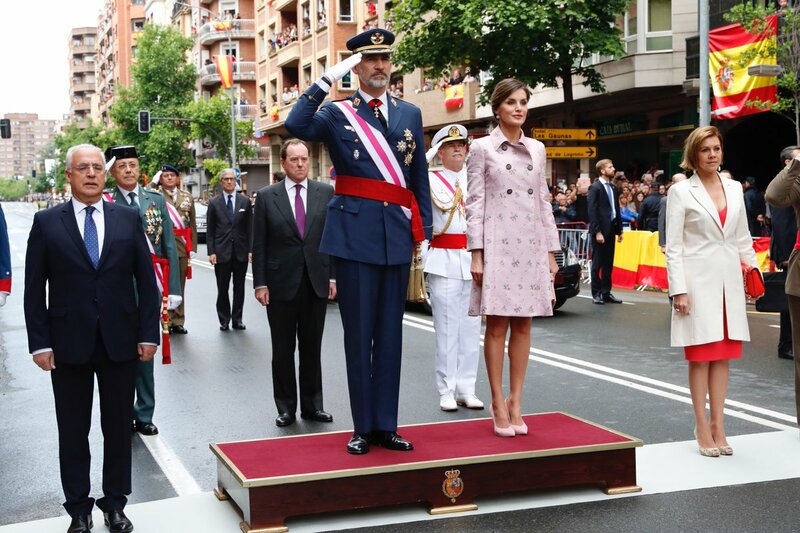 Queen Letizia of Spain, who just finished her 4 day long cooperation trip to Dominican Republic and Haiti, today joined her husband King Felipe VI for the celebration of Armed Forces Day in Logroño. Armed Forces Day is observed in Spain since 1978. It started as a purely military celebration, but with time becamea more colourful and popular event, the central act that is held each year at a different city. Since 1987 it is observed the Saturday nearest to 30th May, feast-day of Saint Ferdinand, King. Upon arrival King and Queen were received by the Mayor of Logroño and army heads. A Battalion of the Royal Guard gave honours to the Royal couple. King Felipe, who is Captain General of all three armed forces, reviewed the forces. Three Royal Guards, representatives of each of the Armies and the Navy, and a Civil Guard carried the Flag that was later hoisted to the National Anthem. 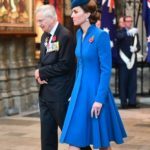 A tribute to the fallen was paid by the King and armed forces which consisted of the interpretation of “Death is not the end” and King laid a wreath in the honour of fallen soldiers who gave their lives to defend the nation. The event ended with a formal parade. 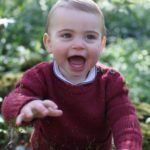 A reception was offered to the three armies and Civil Guards in the presence of their Majesties where they met with defense and civil authorities. 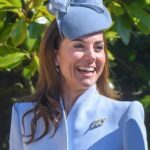 Before leaving King and Queen greeted the members of public gathered around to watch the ceremony. 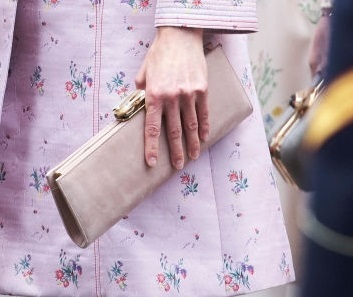 For the somber and cloudy day, Queen Letizia brought the touch of a colour to the event with her pink look. 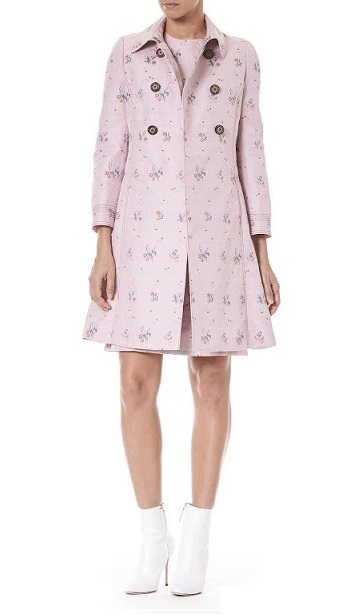 She wore Carolina Herrera floral print Pastel pink coat dress that she premiered last month to welcome the Mexican President and First Lady at the palace. 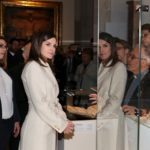 Letizia paired the outfit with Rosewood Suede Lodi Pumps and carry Felipe Varela dusty pink suede clutch with golden closure at the top. 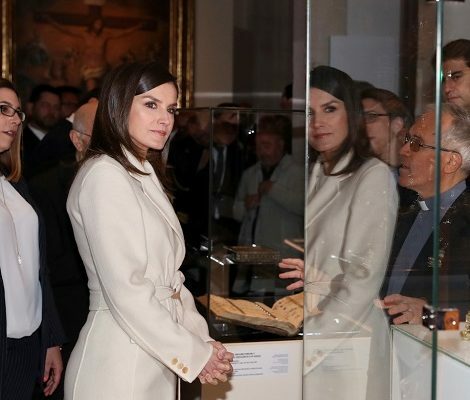 Here Queen Letizia’s appearance at the event in 2017, 2016 and2015 respectively.